Congratulations, there is so much to organise over the next 9 months. Between doctor’s visits, setting up the nursery and cooing over tiny shoes – it is important to schedule a trip to the dentist, ideally in the second trimester. Which dental treatments are safe when you’re pregnant? Read on to learn more. Is it safe for expecting mums to see a dentist? Absolutely – and there are many excellent reasons to schedule a trip to the dentist before bub arrives. We can help with some pregnancy-related symptoms you may be experiencing, and get your mouth in tip-top shape before bub arrives. Research suggests that a mother with a healthy, decay free mouth is far more likely to have a baby with a healthy mouth. There are also dental conditions such a periodontal disease which can affect the developing baby, and need to be treated fairly urgently. Cosmetic procedures, such as whitening, should be postponed until after baby arrives. Please let us know if you think you are pregnant and how far along you are. Dentistry is very safe in pregnant women, but there are some procedures which should be postponed. Does being pregnant affect my mouth? There are many strange and unique symptoms that come with being pregnant, and the mouth is certainly not immune to this. Pregnancy Gingivitis: 4 in 10 women will experience bleeding gums during their pregnancy, although the number could be much higher. The hormones that lead to the development of the placenta will increase the leakiness of the delicate blood vessels in the gingiva. You may notice that the gums bleed more when you brush or floss, and can lead on to more serious conditions if left untreated. Gingivitis is caused by plaque build up and can generally be resolved easily with professional dental cleaning and oral hygiene techniques. Periodontal disease: Periodontal disease is a more serious form of gum disease, and can result in permanent bone loss and gum recession as well as being linked to preterm and low birthweight babies. Premature delivery is associated with a whole raft of lifelong problems for your baby. The symptoms of periodontal disease include bleeding when brushing or flossing, bad breath or loose teeth. Pregnancy Tumours: 1 in 10 women may experience pregnancy tumours, which are localised swellings in the gingiva which are an extreme inflammatory reaction to plaque and may appear like a small raspberry. They tend to resolve spontaneously after birth, and generally don’t need to be treated, unless they interfere with your bite, or are painful, or persist after birth. Increased Decay Risk: Pregnant women are at a higher risk of dental decay. This may be due to increased snacking, cravings for sweet or carbohydrate-based food, morning sickness eroding away enamel, and difficulty with brushing and flossing brought on by an overreactive gag reflex. There is evidence that the bacteria in mum’s mouth will colonise baby’s mouth through kissing and tasting of food. If mum has a high decay rate, there is a good chance that baby could get cavities when the teeth come through. It is important to have any cavities treated before baby is born. Modifications to oral hygiene and diet can also help in reducing cavity-causing bacteria. Can I have X-rays when I am pregnant? 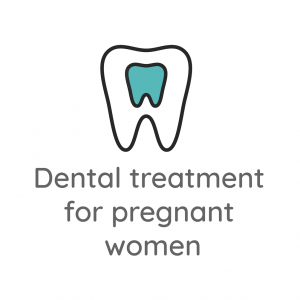 Which dental treatments are safe when you’re pregnant? How about x-rays? While we tend to postpone routine x-rays during pregnancy, they may be needed for treatment (root canal for example) and are quite safe. Digital Dental x-rays have the lowest radiation of any medical x-ray, and the risk can be further reduced by use of a lead apron. It is far better to get a correct diagnosis and treatment by taking an x-ray, than leave an expecting mother with painful infection in her mouth. An infection may have a greater effect on bubs development than an xray. Can I have local anaesthetic when I am pregnant? Local anaesthetic is totally safe to use in pregnant women. If you need any fillings, extractions, or root canals, you can feel assured that the procedure will be pain free and the numbing will not have a negative effect on bub. There is no link between local anaesthetic and premature birth, miscarriage or birth defects. What about medications prescribed by the dentist? Please tell us if you are on any medications, including over the counter. If we need to give you an antibiotic or pain killer, we will ensure that we prescribe the medication with the lowest risk. Please talk to us if you are concerned. Try rinsing your mouth out with water if you have been sick. Add a teaspoon of bicarb soda to water which will neutralise any acid in your mouth. You shouldn’t brush immediately after vomiting, as the enamel is softened and may be brushed away- Become the best brusher and flosser you have ever been. Now is the time to try an electric toothbrush. My floss lives in the shower on my conditioner bottle, try flossing while you condition your hair! If you are retching when you brush, an electric toothbrush or a child’s tooth brush with a smaller head may help. Try switching toothpaste brands if certain flavours aren’t agreeing with you. Book your continuing care recall appointment with tooth dental – we can’t wait to hear your exciting news and look forward to welcoming a new patient (baby) to the practice. Please contact the friendly team at Tooth Dental by calling 07 3366 1737 or click here to enquire online – we’d love to help!